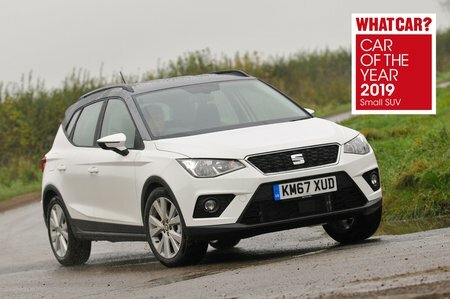 Seat Arona Interior, Sat Nav, Dashboard | What Car? The Arona's driving position is fundamentally sound, with plenty of seat adjustment and pedals that line up neatly with the steering wheel. However, some of our testers wish the steering wheel would retract slightly farther into the dashboard. 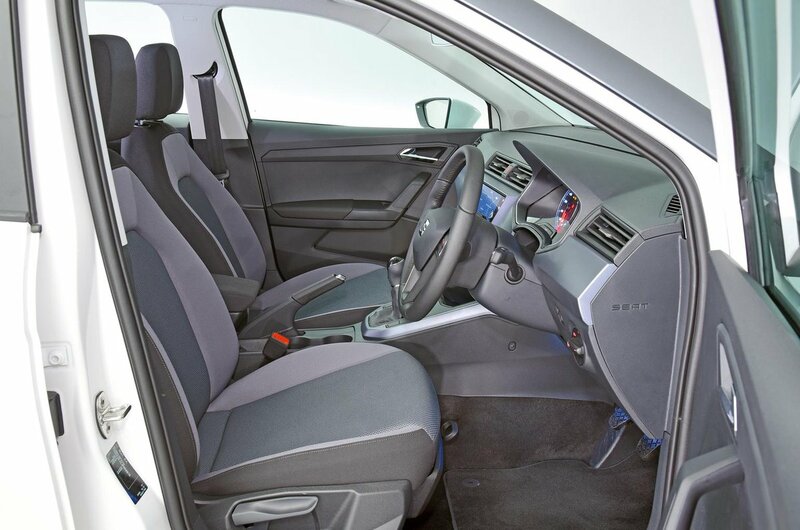 You only feel a little farther above terra firma than you would be in a regular small hatchback, so don't expect a proper SUV driving position. If that's a deal-breaker, it's worth bearing in mind that you sit suitably higher in a Citroën C3 Aircross and a Volkswagen T-Roc, although none put their drivers up in the clouds like a Range Rover does. Meanwhile, the Arona's dashboard is logically ordered, with chunky, clearly labelled buttons and an air conditioning control panel that’s angled towards the driver to make it easier to read and operate while you're driving. Fortunately, the Arona’s eye-catching looks haven’t come at the expense of forward visibility. The windscreen pillars don’t obstruct your view too much – even when pulling out of junctions – and the fact that you sit a bit higher up than in a conventional hatchback makes it easier to judge the car’s extremities. The Arona’s heavily styled rear end does make it trickier to see out of the back when parking. However, all trims apart from entry-level SE come with rear parking sensors, while range-topping Xcellence Lux models also get sensors at the front of the car and a rear-view camera. Powerful LED headlights are standard on FR trim and above and deliver much better night vision than you get on cheaper versions of the Arona. 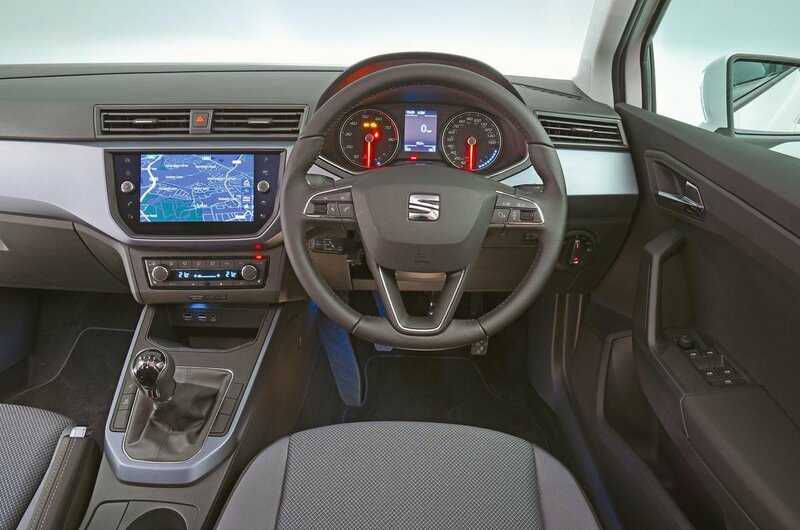 Every Arona has a touchscreen infotainment system, ranging from 6.5in on entry-level SE to 8.0in from SE Technology upwards. That trim level is also the entry point for a built-in sat-nav, a DAB radio, wireless phone charging and Apple CarPlay and Android Auto smartphone mirroring. The smaller touchscreen is a bit fiddly but the 8.0in version is generally excellent. It's crisp and bright and responds quickly when you prod it, while the menu system is easy to get your head around. In fact, it's one of the best infotainment systems in the class, although the fact that it's a touchscreen inevitably makes it a bit distracting to use while driving. The Arona’s close links with the Ibiza are patently obvious here. Indeed, the interiors of both cars are pretty much identical. The Arona's dashboard is built exclusively from hard – mostly grey – plastic, although everything seems sturdily assembled and the leather on the steering wheel doesn't feel cheap or tacky. The leather-wrapped dashboard face of range-topping models might seem like a small touch, but it’s a trick that Range Rover has been using for years and really helps lift the Arona’s interior.